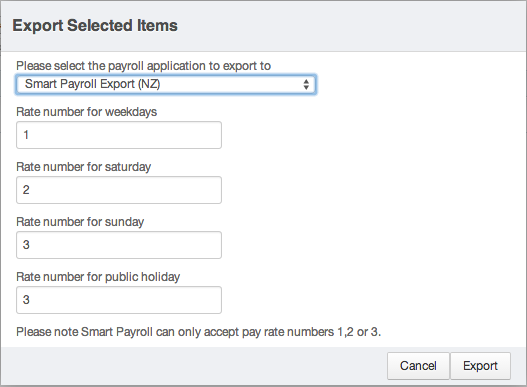 Before exporting to SmartPayroll, you'll need to have prepared to export from Deputy. You'll also need to set each employee's Export Code in Deputy to match their Employee Code in SmartPayroll, which by default is their first and last initial. The export code may not be more than 5 characters long, and is set in SmartPayroll by going to "Employee Details" at the top of the screen, then selecting an employee from the Employee List, then selecting "Employee Details" from the list to the left. In SmartPayroll, you will need to set your pay rates. 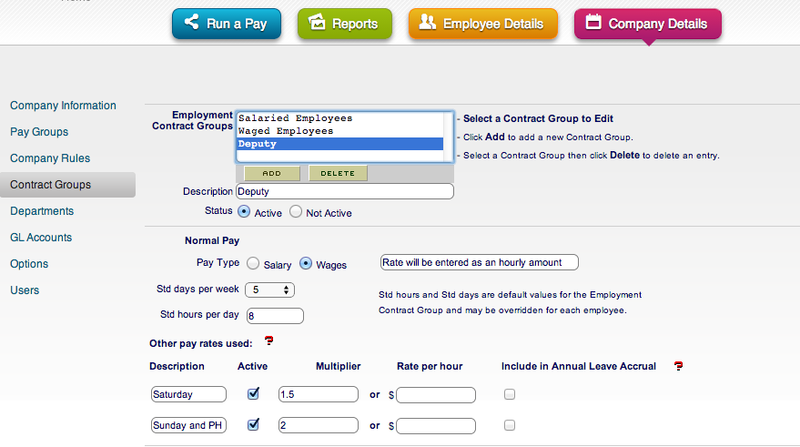 The first rate must be your employee's base rate in SmartPayroll, set in the Employee Payments section. The second and third are optional and are set in your Employee Contract Groups, found under the Contract Groups tab in your Company Details. The rates may be either a fixed amount or a multiple of the employee base rate. Here you may also set your employees standard days and standard hours. After selecting "Export Selected Items" in Deputy, you will be asked to fill out the pay rate numbers for the timesheets being exported, requiring you to set a Weekday, Saturday, Sunday and Public Holiday rate. Please be aware that you may only set three pay rates, ideally one for weekdays, another for Saturdays, and the last for Sundays and Public Holidays. Once you have set the pay rates, please click export, which will create and download a CSV file. Next, please open SmartPayroll and click "Run A Pay". On the list that will appear to the left, you will see "Timesheet Import". Please click this, then on the page that appears you will see "Choose File". Please click this, then upload the file that you have just downloaded from Deputy. Once the data has been successfully imported, you may process your pay as usual.